I have a confession to make: I’m a serial Googler. In my role, I often end up having to reach out to people at other organizations. If I have a question for them and I don’t have their contact information, I head straight to Google and frantically scan for an email address or phone number. But all too often, even Google can’t save me. Over the holidays, I needed some insight for a project I was working on, and I knew just who to contact: it was a person I met through a professional association we’re both members of. However, I couldn’t find her contact information on their site, and online searches weren’t getting me anywhere. I ended up reaching out via Twitter, which didn’t seem as professional but was unfortunately my only option. This experience got me thinking about the importance of member directories. If my organization had one, it would have saved me valuable time and facilitated the start of a great professional relationship. Are your members experiencing a similar issue? In this post, I’ve listed what most organizations’ member directories include, as well as why your organization might want to implement one. Member directories include the name and other key information your organization stores about members. Other optional information such as academics, family information, charitable focus, etc. In many cases, member directories are searchable either by the public or other members. The choice to make a directory public is up to the discretion of the organization as well as the member’s privacy settings (more on this below). Organizations may want users to create individual profiles that link to the main directory. This practice is common in professional associations where networking and mentorship are encouraged among the member base. Whether it’s a longstanding organization or a new one, member directories can help legitimize the group. They’re an instrument you can use to showcase strong membership rates, advertise membership levels, and tout standout members and their accomplishments. There are countless reasons why your members may want to connect with other members. For example, they may be looking for mentorship, assistance, or an opportunity to network. By using a member directory, your organization makes this essential contact information open and available so that members can seamlessly contact one another without the middle man (aka you!). If your organization encourages collaboration, a member directory isn’t just helpful — it’s essential. Depending on how you structure your membership directory, it can be seen as a real benefit of membership. Chances are, your members pay dues, donate time, or provide something else in return for membership to the organization or association. With this in mind, a member directory can serve as a tangible benefit because it grants access to a list of other members. In many circles, such as in professional networking environments or social groups, this information may be considered invaluable. It bears repeating that member directories aren’t just helpful for members, they also benefit your staff and other organizational leaders. Besides serving as a communications hub, thus taking pressure off of your staff to manage the exchange of contact information, member directories are a searchable tool that an organization can use to segment groups, track membership status, and even target communications. Look at it as a complement to your CRM. Most member directory programs, including Wild Apricot’s Member Directory, allows each user to customize their information and set privacy settings. This means that individuals have control over what information they share and with who they share it. For example, a member can choose whether they want their profile viewable to the public or just to fellow members. Should I Use a Print or Online Directory? While it’s completely up to your organization, online directories are a more fluid and affordable option. Members can change their information at will and in real time without the need for you to reprint an entirely new directory. Plus, an online directory saves on postage and printing costs and is better for the environment. 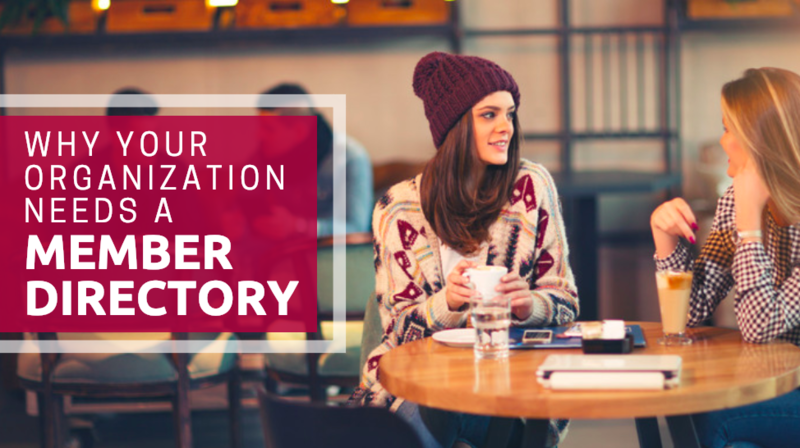 What’s the Best Way to Collect Member Directory Information? Ideally, each member will create their own profile that connects to the main member directory. However, 100% participation is something most organizations rarely see. If you plan to create a member directory, offer to assist members with the initial setup of their profiles. At the very least, ensure each member’s name and status is listed in the directory automatically. In case you were wondering, I was able to connect with my association colleague and get her contact information. I also made sure to ask our association's president about a timeline for an online member directory. Great news: it’s in the works! If you want to build your own member directory, we’re here to help. If you’re a Wild Apricot customer, simply follow these steps to create your own directory. If not, you can start a free trial to see just how a member directory can help connect your members.